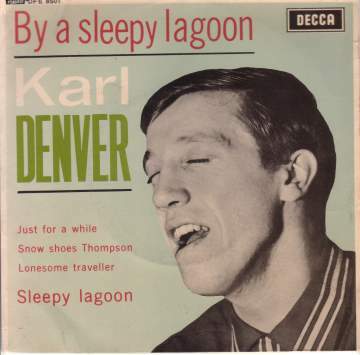 Karl Denver's western yodelling style really caught the imagination of record buyers during the early 1960s. Few of us realised that the man behind the wonderful voice wasn't a genuine American country singer or a Texan cowboy. In reality, Karl Denver was more familiar with the streets of Manchester, and the residents of Reddish were only too aware who owned the big American automobile that they frequently saw being driven around northern Stockport. Karl was well travelled by the time he took up singing, having had a previous career in the merchant navy. He wasn't totally without real 'country music' credentials either because he had actually lived in Nashville for a short time before being deported from there as an illegal immigrant during 1959. It was in the USA that he'd adopted the new name that he retained for the remainder of his singing career. His amazing voice allowed him to bring great originality and power to the songs he knew and to provide them with a whole new character. This was especially true of his interpretation of his biggest hit- 'Wimoweh'. This song which, in common with many of Karl's early releases, was produced by the British rock and roll pioneer Jack Good, was particularly controversial. Karl made it his own despite the fact that it had previously charted (under different names) for the Tokens and the Weavers in the USA. Both the Tokens and Denver versions credit Paul Campbell with authorship, but it is now generally believed that the song was originally written by a Zulu tribesman called Solomon Linda. There is a 45rpm version of this song that is close to the African original; it is 'Mbube' by Miriam Makeba- the only one that credits Linda. The EP shown on the left was the Karl Denver Trio's first and probably most successful. Incidentally, while researching Karl's EPs in one of the catalogues published by 'The Gramophone' magazine I was intrigued by the categorisation used:- "c. and w. teenb and old-time pop. bal, burlesque voc." which I think you can take to mean that Karl didn't slot comfortably into any of the well established pigeon holes. That, for some reason, pleases me enormously. Karl Denver died of a brain tumor a few days after his 67th birthday at the end of 1998 although Karl had claimed that he was born during 1934- probably because he liked to appear younger than he really was. Gerry Cottrell left the trio towards the end of the 1970s and Keith Elliott became his long term replacement. Kevin Neill can still be found in cabaret and (usually Blackpool) summer season along with John Stokes and Jonathan Young who together have revitalised the Bachelors.